Looking westward toward the Truchas Peaks, New Mexico, November 2017. I have been traveling to Taos, New Mexico, several times in the past year. I stop at this spot near Mora Pass that is up in altitude from Sipapu Lodge in order to look back at the mountains before I head down the Mora Pass to Holman, Cleveland, Mora, and Las Vegas. The valley you see in the foreground is the starting valley and surrounds for Rio Pueblo that flows eventually into the Rio Grande near Embudo. I have climbed two of the three Truchas Peaks, encountering Bighorn sheep on the trail to the summit. I was in my twenties when I climbed; now I am seventy-five years old and I stop and look back on the mountains and my life, the near and the faraway. Lately, within the last few weeks, I have seen near my home in Fort Worth the most beautiful coyote poised and stationary alongside the Chisholm Trail Tollway, its coat shiny and tail bushy and full. In my frontyard, two racoons ambled by and climbed into the trees. A bluejay in the neighborhood warns others of my approach as I walkabout. At my Far Field near Mingus, Texas (the source of most of my posts on this blog), I have heard the Sandhill Cranes in the sky, but failed to see them catch the thermals. But, I hear them. I see the turned soil of wild hogs in my field, the voles that run away from my tractor when I shred mesquite. When I was in Lubbock at Thanksgiving I heard and saw flocks of Canadian geese in the air and along the playas of the region. Magpies fly across the backyard of my daughter’s home in Taos. I am looking and I see the wild on this earth. I am having a conversation with the wild. And, I listen so attentively and look so closely that I am beginning to grieve as I never had before. Flying Hat Ranch, North Erath County, Texas, Lat 32.43 N, Long -98.36 W, elev. 1,086 ft. Turkey Creek Quadrangle map. 1930. Turn around at northwest corner of far field and return to house. Star whinnies at me. 1938. White-crowned sparrows fly low in brush about arena at southeast end. 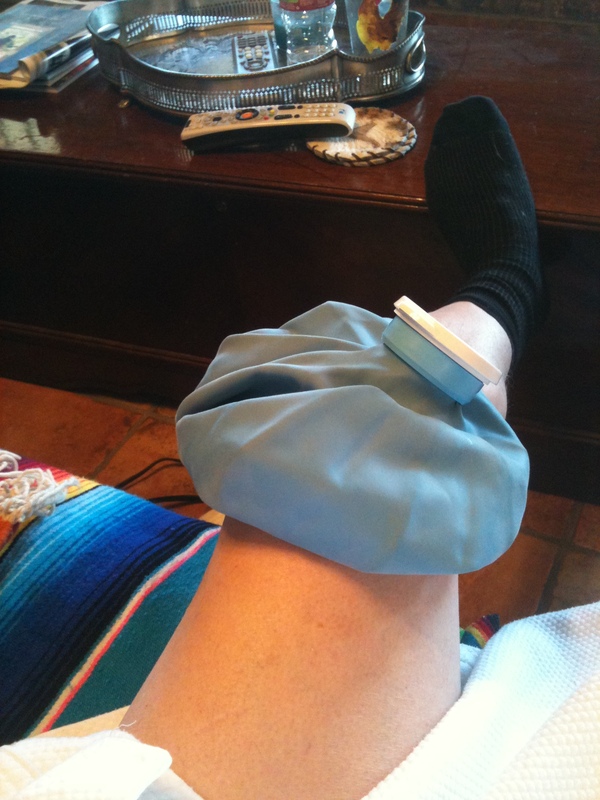 Given the fact it’s a Saturday and most people want a calm and relaxing — well, maybe some activity — after a hectic week, the last thing a person needs to see is a knee with icebag. My apologies, readers, but here it is or rather up there is the knee. I was chasing Sandhill cranes most of the day to photograph them. It was Wednesday and I divided my time between working on Blackboard (I teach five online classes of history) and going into the field of 53 acres of Flying Hat Ranch (FHR). As my posts indicate from Wednesday, I was hearing but not seeing the elusive, high-flying bird. It was a good day and I got work done, issues resolved on Blackboard and shot a number of photos for fieldwork. I found and marked with an engineer’s flag several lithic tools in the field. But every time! I heard the Sandhills, the camera was either in the truck or at the house. Besides, until late afternoon, I didn’t see any. Brenda comes home from work and I am walking back to the ranch house from the barn and I hear the Sandhills and look above me and what to my wondering eyes should appear but about 300 Sandhills, in at least two V-formations. Beautiful and they were calling. So, I broke into a sprint. On my first or second spring up the lane, something popped or snapped in my leg. I skipped, not sprinted, to the house and got the camera, but the cranes had their throttles to the wall and I missed the shots with the camera. But I did see them. My leg hurt and in the middle of the night, at two o’clock, I woke up in pain and by Thursday morning, I could barely walk. I went to Fort Worth to the clinic and they sent me to Harris Methodist hospital for x-rays. The P.A. told me I might be looking at an orthopedic surgeon! Or rather, he would be looking at me with a scalpel in hand. As it turned out, Friday I learned (after icebags and pain pills) that nothing was broken or torn, but it was arthritis! Good news? Bad news? How in the dickens can arthritis bring me down to jumping on one leg from bed to bathroom, for crying out loud? I don’t know, but next Wednesday I have an appointment with my Primary Physician for a yearly checkup and in addition to him invading my body cavity without mercy, he will enlighten me on the knee. Brenda is taking care of the dogs and Star. I’m looking at walking canes on the web. Ever Google “canes”? Well, live long enough, you will. There are all sorts of canes. Canes that fold, canes that have stupid heads on them, curved canes, canes with swords and even canes with risque girls painted along the stem and nose (there’s a whole glossary of cane nomenclature). I’ve not picked my cane. I have some nice looking cedar staves down along the barn I may craft upon and develop an Etsy Shop for homemade canes. Lilly, the good old girl that we had to put down in January, had osteoarthritis too, and in the left knee really bad. But, you know what? She got up with a struggle and ate and walked and even pranced in the snow despite her knee. She’s taught me a lesson about arthritis among many I’ll eventually churn out on Sage to Meadow. I’m up and I’ll be in class Tuesday. Star will be fed — I’ll do it slowly. I’ll continue to contemplate canes. If my knee continues to be painful, I’ll have to hire a person to do some seasonal work. I’ll do a jig in the snow. Frankly, if I had to hurt myself, I’m glad I was chasing Sandhills rather than tripping over the cat. And, if I had to learn a lesson about dealing with the pain, who better to be my teacher than Lilly? When the student is ready, the teacher will appear. She did and doesn’t even know it. Enough of this! Now, where’s that pain killer I used to give Lilly? Oh, yes, it’s in the tack room next to the saddles. Two ducks on stock pond, November 1, 2010. Your habitat, wherever you may be, probably sustains larger flocks of ducks, but I was glad to see these two ducks on our pond once again this Fall. 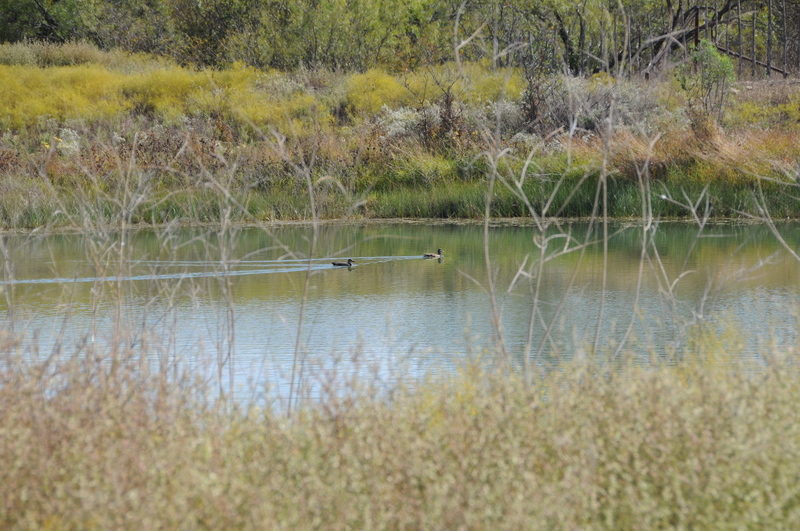 I walked across the Arena Pasture, diagonally to the road and directly to the pond, quietly edging up the slope and stopping in an area of broomweed in order to take a photograph of the two ducks. I had seen them three days ago and yesterday there were a dozen or so of their acquaintances feeding on the pond. When I finished snapping this photo, I walked on the road and scared up other ducks that were feeding, altogether about twelve. I will be more careful and not frighten them to flight although they rise just enough to clear the cottonwoods and land on Blue Pond, our neighbor’s stock tank to the east of us. I took this walk after lunch, down to the Grove and around the edges of Salt Creek that has several caches of water, but is not flowing owing to the lack of rainfall. The water caches provide a source of water for deer, raccoon, fox and bobcat, among other species. Birds drink their fill and as they scatter in the trees, I hear their wings slap leaves. I walked, ambled is more like it, for forty-five minutes, taking photographs of foliage. Yucca in the Grove as I ambled on November 1, 2010. I came across a species of yucca that I must identify. I think it different from the narrow Pale-Leaf variety we have close to the house. 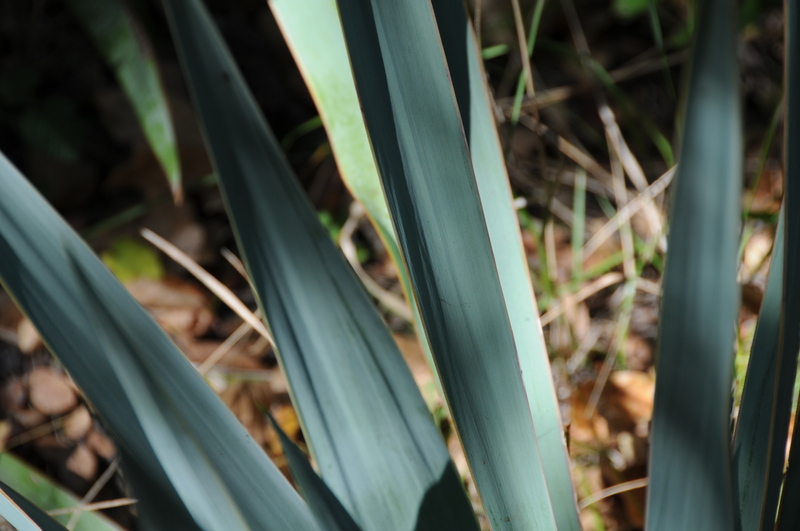 This yucca has broader leaves and its color is a deep turquoise. The turkey bones that Olivia, my granddaughter, and I discovered this summer have been carried off. No feathers of the Thanksgiving fowl remain. What animal would carry off bleached bones and feathers? I eased into this walk today, relaxed and breathing deeply. Nothing lay ahead of me except my next step, my scan of the ground and sky. I would have liked company, but this solitude was restful and aimless, other than to walk to the far field and turn around to retrace my trail. I could hear the dogs bark back at the house. Then, I heard them. Sandhill Crane. 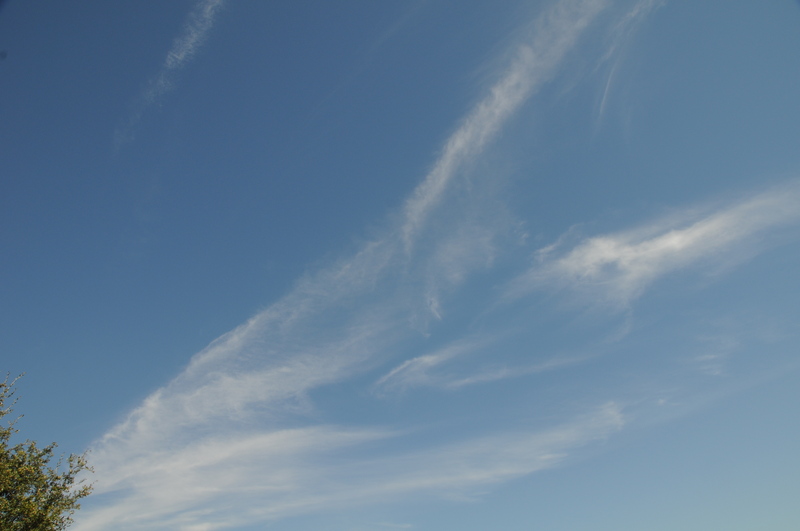 I looked high and all I could see were the stratocirrus clouds. Their calls are like burbles, water gently falling over smooth stones in a clear stream. Gentle and calming. I could not see them. Their calls faded and I walked back up to the house. I stood for a moment on the back terrace and as I started back into the house, I heard a flock of Sandhill again. 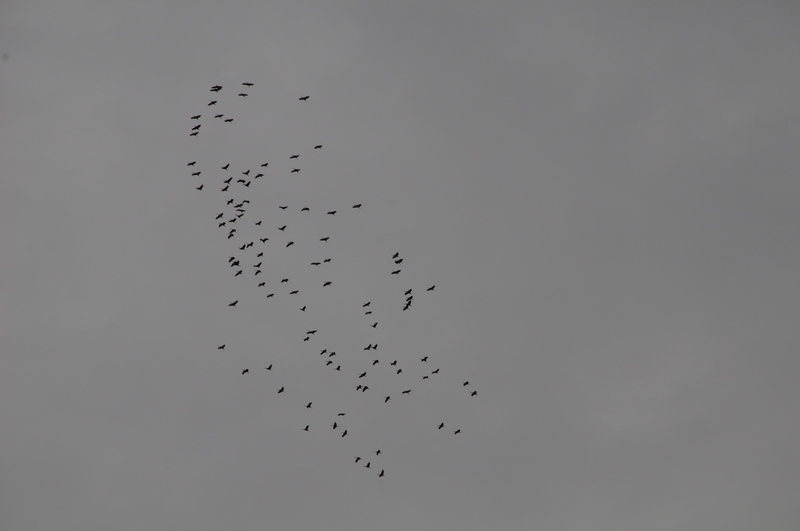 I looked up and 2,000 plus feet above me, a flock of crane flew. They could of been higher above ground than that and as I pulled my camera up for my first shot of the season, I could not see them. But I had seen them and they had such a pale-grey, whitish even, underside that it reminded me of the underside of jet planes I see above. Their undersides reflected the clouds below them and I took a photograph of where they had been, aiming their graceful necks towards the southeast and warmer climes. I shall photograph them soon, but today I could not find them low to our earth for they soared above me and my camera. I heard them. I saw them, but their image I could not preserve en camera today. But I photographed two ducks for our Fall season. What’s the saying, “Sufficient unto this day?” I think so. Stratocirrus where the Sandhill Crane had flown, November 1, 2010. North Erath County, Texas, 32.43 lat., -98.36 long. Elev. 1,086 ft. Turkey Creek Quad. Resident hawk(s) is not a red-tail. Unable to verify type. Possible Goshawk (Accipiter gentilis). Conventional scream or call. Same resident hawk with sibling I have seen in the grove. Nest high. Grasses emerging in Pecan Tree pasture. Side-oats gramma is approx. three (3) inches high. Dead grass has given cover for small untyped birds and gramma sprouts. Three flocks of Sandhill Crane (Grus canadensis) seen in afternoon. Tuk-tuk alert to look up. Flocks flying 75-100 m.p.h. ground speed est. Altitude est. 2,000 feet above ground level. Wind south-southeast. Three stragglers. Again, only a few tuk-tuks, indicates leader or alpha call? These flocks number 200-300, but only few calls. Why? Evangeline Chavez in at Bosque Apache in New Mexico sights Crane flights today. She is 600+ miles away. Shiney the colt has twenty (20) mane hair samples with roots sent to U. of C., Davis for DNA typing and registration with AQHA. Brenda reached through corral fence for mane hair. He’s a good boy. Nephew of Kelly Dooley, the Dooley place, shoots .22 caliber pistol or rifle to the west of us. Bullets whiz through corral near Hija and me. Emergency call to Kelly. She gets nephew to orient himself away from corrals. Four (4) bullets pass through air while I am in corral. Brenda on porch has one bullet pass by. Bullets sound like big, fast mosquitoes: low tones, not high tones, buzzing. Nephew is from town, goes goofy in country. Deeply apologetic. Native brush sprouting buds and yellow blossoms in grove. Gathered two (2) large stones from grove. Filled Pecan Tree water trough that Olivia helped me fill at Christmas. I’m sitting with Brenda out on the back porch thirty minutes ago and I hear the tuk-tuk of the Sandhill Crane. I get the binoculars and camera, but I cannot see them in the sky. The second flock comes by within five minutes and I snap the pictures above. The Sandhill are flying fast with a east-southeast wind at their tails. I estimate their ground speed may be 75-100 m.p.h. I have to work fast. 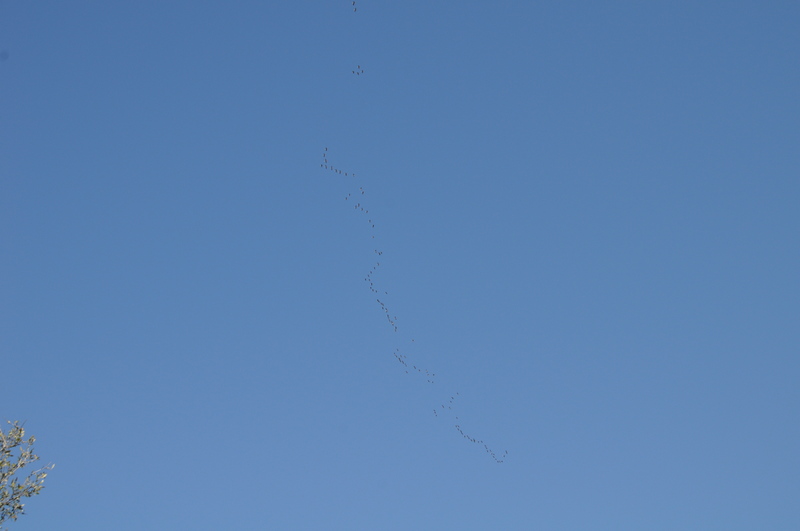 I took pictures of a third large flock and then three stragglers (teenagers, most likely, sleeping late) soaring fast. See the two pictures below. Yesterday at about 5:45 p.m., as I returned from the pasture, I heard the Sandhill Crane, tuk-tuk–tuk-tuk, and looked south towards Hannibal, Texas, the direction I had seen flocks earlier this week. I saw no flocks to the south. Catching the sound again, I looked east towards the Rust Ranch (whose horse barn repeats my microwave for internet service) and saw a huge, migratory, single congregation of Sandhill Crane heading north, three miles away, 1,500 feet a.g.l. over the Rust Ranch barns. 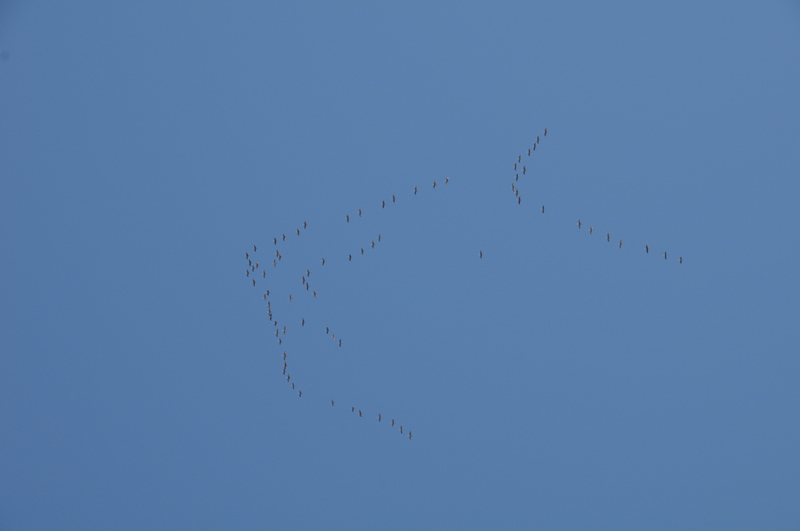 By my quick and dirty count, I estimated the northing cranes at about 350-500 in number. My camera was back at the house, so I could not get there in time to snap a picture of this huge flock. I may have this wrong, but I discerned that in this large flock of 350+, only, say, ten cranes calling, tuk-tuk. I would have thought more vocalizations from such a large group. But no. It was the largest flock I have seen in flight. I have heard large flocks on the ground in the Muleshoe, Texas, marshes and their murmurs are quite numerous before daylight. Beautiful, peaceful chorus. Yesterday, February 28, 2010, as I came back from feeding the horses at 5:50 p.m., I heard the tuk-tuk–tuk-tuk–tuk-tuk of the Sandhill Crane overhead. The cranes were heading north, about 1,500 feet above ground level. I first saw them over Hannibal, Texas, six miles to the south of us, and after I got the camera and starting taking pictures, they had flown over the ranch and were two or three miles away to the north. They were circling and moving north at the same time. Thirty minutes later, another flock of cranes, this group shaped in a V configuration, were flying faster in the same direction. Their tuk-tuk calls were less frequent. I suppose they were intent on catching up with the crowd ahead of them who had found, most likely, a good marsh to settle down for the night. Preferring flight than chat, they sped quietly into dusk. 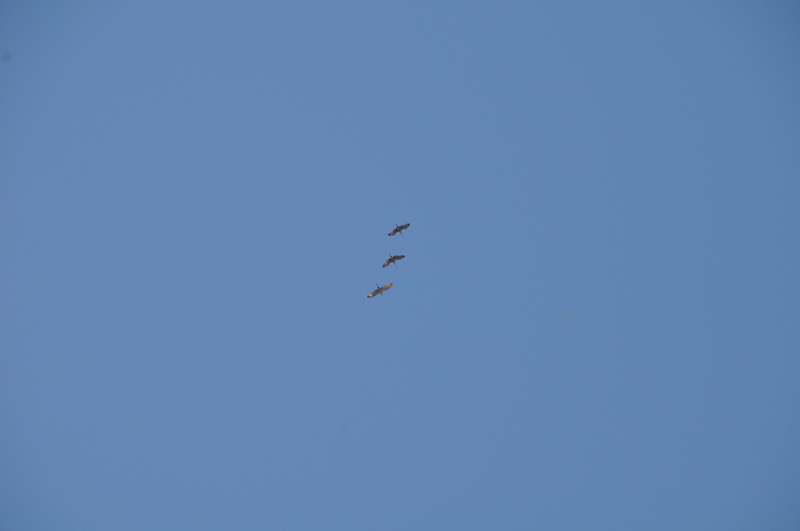 Yesterday, October 30, 2009, I saw three flocks of Sandhill Cranes flying south over our place. They were at a height of about 1500-2000 feet. Each flock contained about fifty cranes. A trilling call among the flock signals they are in the air. The Sandhill Crane call is almost like a cat’s purr, only higher in pitch. As a side note, also yesterday, I heard crows screeching on the Dooley’s place to the west of us. I looked up and saw four or five crows chasing and harassing a large red-tailed hawk out of the sky. The crows would fly almost directly into the body of the hawk, pushing him outward to the east over our place. The crows relented and the hawk flew overhead, towards the east, emitting a high whistle of a call as it flew. We have several hawks on our place and I doubt that they will survive the great and mighty hunters of Kentucky that seem to descend on neighboring farms during this season. Yes, mighty hunters that disrespect wildlife and kill wildlife with powerful rifles while sitting in deer stands in their polyester coats, sipping whiskey. The hawks, deer, fox, and other critters know that when they are on the Matthews place, they are safe. I don’t condemn the man or woman that must take a life for food. But take a life for trophy or brag is disrespectful and that life taken and not respected or honored in its death will come back on that man or woman in their dreams and thoughts until the day they die. Killing fields exist off of the high ground of warfare. Several years ago, circa 1975, Charles Fairweather, Selden Hale, and I went to Muleshoe, Texas, to get up early in the morning and hunt Sandhill Cranes at the wildlife refuge. We weren’t that serious in hunting them; it was more of chance to leave Amarillo for the night. That next morning, we loaded up on flatbed trailers, about 50-60 hunters per trailer, and drove out to the refuge. We crouched about 300 yards from where the cranes were spending the night. The chatter of the cranes in the dark was peaceful and lulling. The three of us began to regret our hunt. When daybreak occurred, the cranes began to fly, and most hunters could not reach the altitudes with their shotguns at which the cranes flew. The cranes would circle higher and higher before they flew over the mighty hunters of Kentucky. I saw only one crane killed. A hundred to two-hundred hunters, killing one crane, and it would not be eaten. Neither Charles, nor Selden, nor I fired a shot. We went back to Amarillo and ate lunch, saying little about the morning’s early light.